Esko Mustamaki , Yoshioka Tatsuya and Jon Rysst during the event. Peace Boat has signed a letter of intent (LOI) with the Finnish shipbuilding company Arctech Helsinki Shipyard Inc., to construct the Ecoship, the world’s greenest cruise ship. 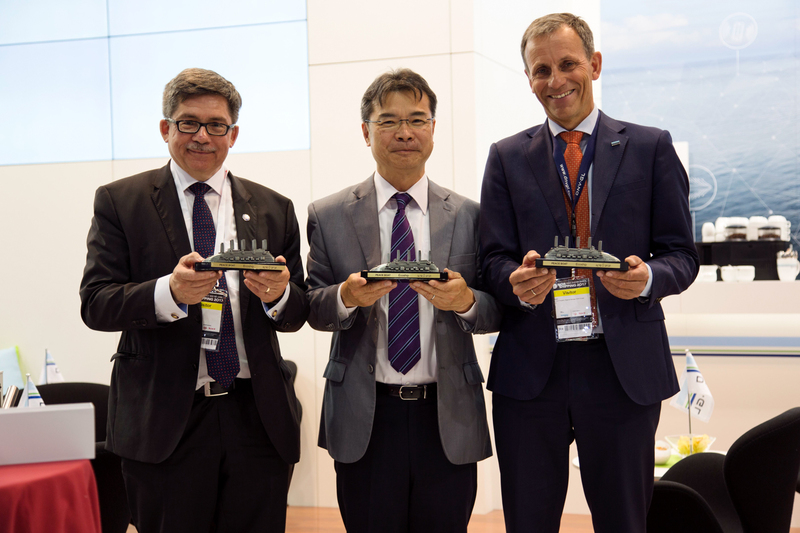 Peace Boat director and founder Yoshioka Tatsuya, CEO from Arctech Esko Mustamaki and Senior Vice President, Regional Manager North Europe, from Classification Society DNV GL, Jon Rysst, announced the agreement during Nor-Shipping, the biggest maritime trade fair in Scandinavia. Yoshioka said: “We have agreed with Arctech to build the Ecoship, the most innovative and ecologically friendly cruise vessel ever. We believe this ship will be a game changer for the shipping industry and will contribute to the protection of the environment. It will be a flagship for climate change. We are very happy to work together with a Finnish shipyard, and look forward to exploring clean and sustainable technologies with partners throughout this region, which is known for its environmental leadership”. Before the event, the CEO DNV GL – Maritime, Knut Ørbeck-Nilssen, said: “It’s really nice to see this innovative and exciting project proceed, this is a very positive development for Peace Boat. For us at DNV GL, it is always wonderful when such impressive projects using environmentally friendly technology take one step further towards being realized and we will continue to support this project”. Ecoship, with its nature-inspired architectural design by Spanish company Oliver Design, will be the platform for Peace Boat’s round-the-world cruise carrying 6,000 people per year; host exhibitions on green technology in up to 100 ports per year; and serve as a floating sustainability laboratory contributing to research on the ocean, climate and green marine technology. The ship also will create awareness and encourage active engagement with the challenges embodied in the Sustainable Development Goals (SDGs).